This pattern is published by Yarn Vibes as the ‘Dervla Sweater’ and is available from Yarn Vibes as a paper pattern. This striking colourwork sweater incorporates vertical stripes and stylised blossoms to evoke the experience of walking through the meadows on a rainy day. The juxtaposition of curved shapes and vertical lines infuses the motif with a sense of rhythm, so that the flowers appear to dance around the yoke. Worked in the round, in DK to Aran weight yarn, Móinéar is a simple design that knits up quickly and is suitable for a wide range of skill levels. This pattern includes a schematic with measurements. This sweater can be worn with varying degrees of ease, according to preference. 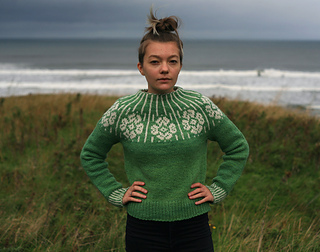 The green sweater is modeled with 2” of ease around the chest. The dark sweater is modeled with zero ease around the chest. stranded colourwork, alternating two-colour cast on, alternating two-colour bind off, short rows, lifted increases. This pattern is compatible with a variety of yarns in the DK to Aran weight range. The sweater will be denser if worked in an Aran weight yarn, drapier if worked in DK. If opting for DK-weight, I recommend choosing a non-superwash, woollen-spun yarn, as this will work best with the gauge. The darker sample in the photos was made with Lettlopi, which works extremely well with this design and gauge.